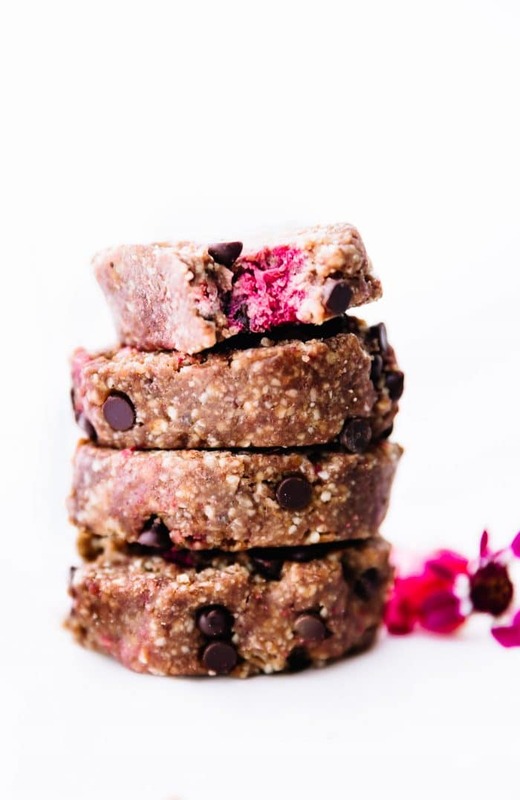 This edible cookie dough, packed with fresh raspberries and vegan dark chocolate chips, is the perfect healthy sweet treat for Valentine’s Day! 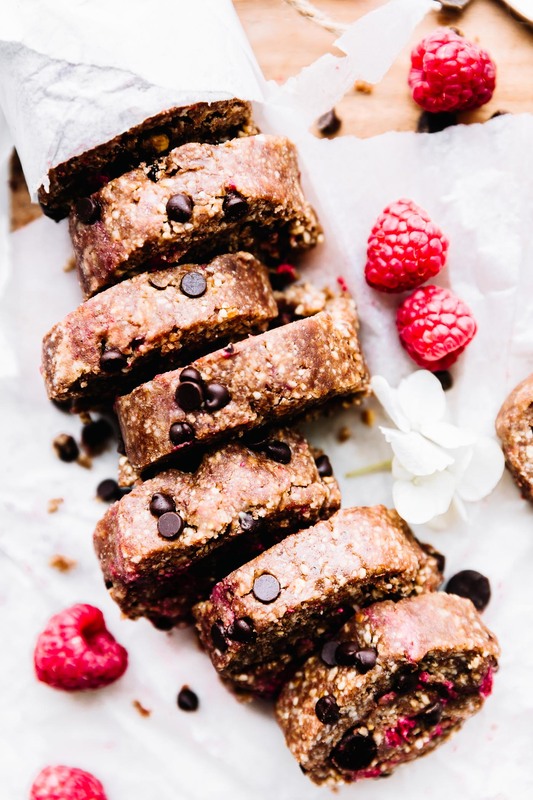 This no-bake dessert recipe is gluten-free, vegan, paleo, and DELICIOUS! Disclosure: This delicious edible cookie dough recipe post is brought to you by my friends at Enjoy Life Foods. Thank you for supporting the brands who help to keep delicious, healthy recipes coming your way! Edible cookie dough, it’s so last year, or so they say. But you know what? I’ve decided it shouldn’t go out of style. So, we’re bringing it back for the love month, FEBRUARY! But with a twist. 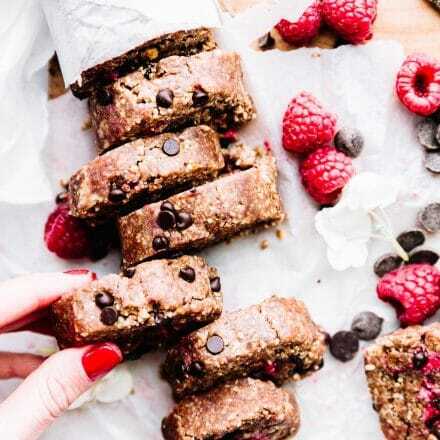 With cocoa and smashed raspberries ALONG SIDE dark chocolate chips. In slice and serve form! Or in my case, slice and hide the rest in the freezer from my husband. Don’t tell him. In all seriousness, when chocolate comes in the form of eggless edible cookie dough, there’s a celebration waiting to happen! No matter the holiday or the food trend. Can I get an AMEN?! Haha! Noe, before we start the celebration, let’s talk! Because I know someone out there is going to ask…. What Ingredients do you need to make edible cookie dough? How do you store it? How do you not eat the whole roll of cookie dough in one sitting? ACK! That one is tough. What’s in it? Simple ingredients! Does edible cookie dough have to be refrigerated? 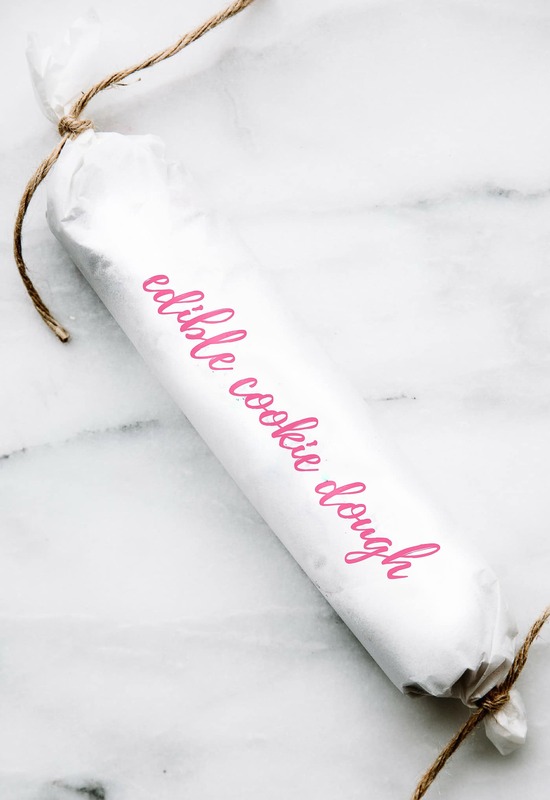 Because this edible cookie dough is egg-free and there are no dairy products in it, you can store it at room temp for a while! But remember, there are fresh raspberries in it, so it’s best to keep stored in the refrigerator or freezer. Plus it tastes better when it’s firm and cold. How long will edible cookie dough stay good? If you cover it well and refrigerate, the edible cookie dough will stay good for at least a couple of weeks. When frozen, the cookie dough will keep well for at least a month. That’s if you can resist eating the entire roll on Valentine’s Day. Haha. Alright my friends, now we can talk celebration! Yes, celebrate the Month of Love with Chocolate, allergy friendly chocolate! Every month is a perfect month for chocolate, but February is one of the best. 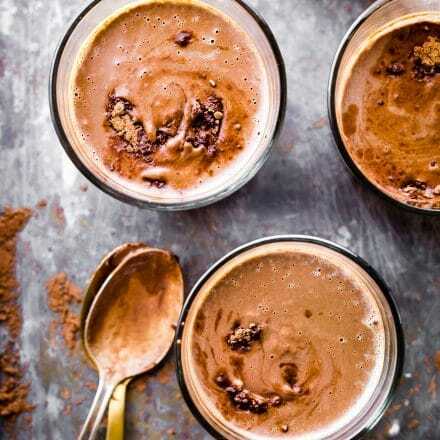 Chocolate has become a traditional Valentine’s Day gift for loved ones, and it’s a central ingredient in decadent desserts and treats. For anyone with food allergies or dietary restrictions, this can be a source of stress and even leave you feeling left out. But, allergy-friendly products from Enjoy Life Foods are amazing and here to help! With their baking chocolates and Mini Chocolate chip packs, everyone can eat sweet chocolate treats to their heart’s content. In addition to the raspberry chocolate-studded edible cookie dough, I use their products just about any chance I can get. 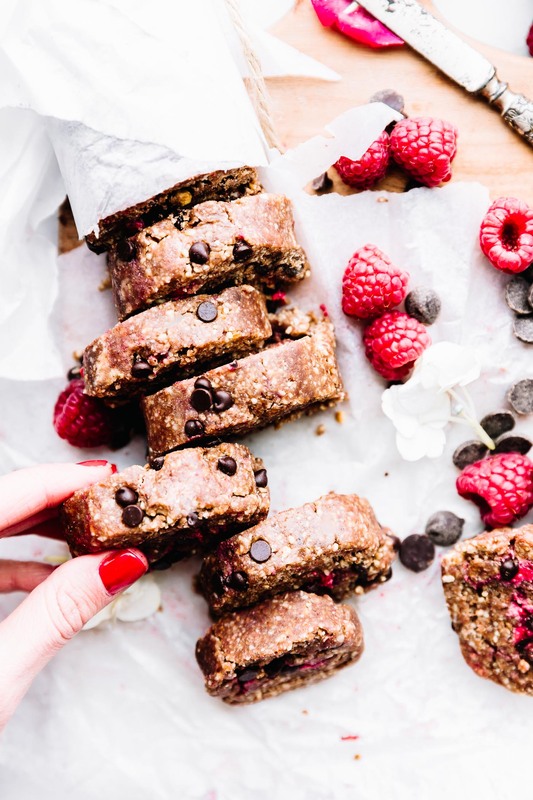 Some of my personal favorite recipes with chocolate that aren’t dessert (but sure taste like it) are Dark Chocolate Almond Butter Breakfast Cookies and SUPERFOOD Boston Cream Pie Banana Oatmeal. Enjoy Life baking chocolates are certified gluten-free, free-from 14 common allergens, verified Non-GMO, certified kosher, AND certified vegan and paleo-friendly, making them a dessert solution for all sorts of people with different types of dietary restrictions. 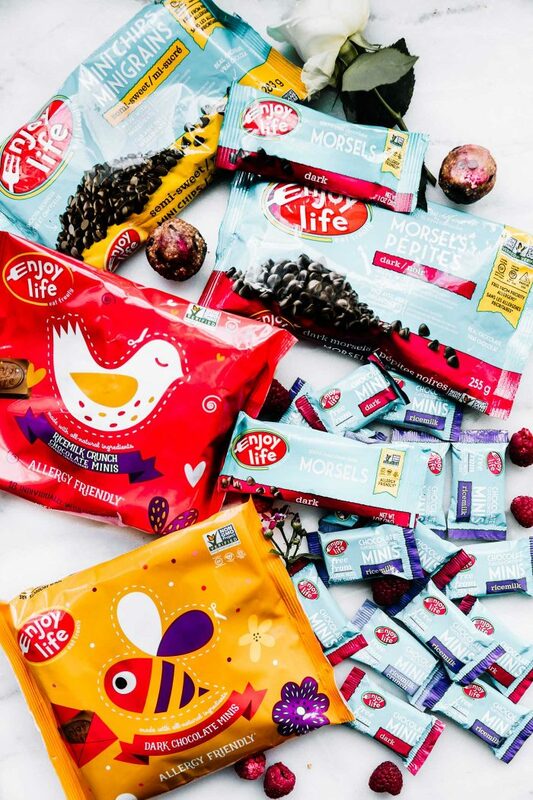 If you can’t find Enjoy Life products in your local grocery store, you can buy them directly from the Enjoy Life Foods online shop! Remember, this edible cookie dough recipe is paleo and vegan-friendly, refined sugar-free, and no baking is required. It’s super fun to make with kids. Just slice and serve or store for later. Oh, and it’s amazing served with coconut ice cream! 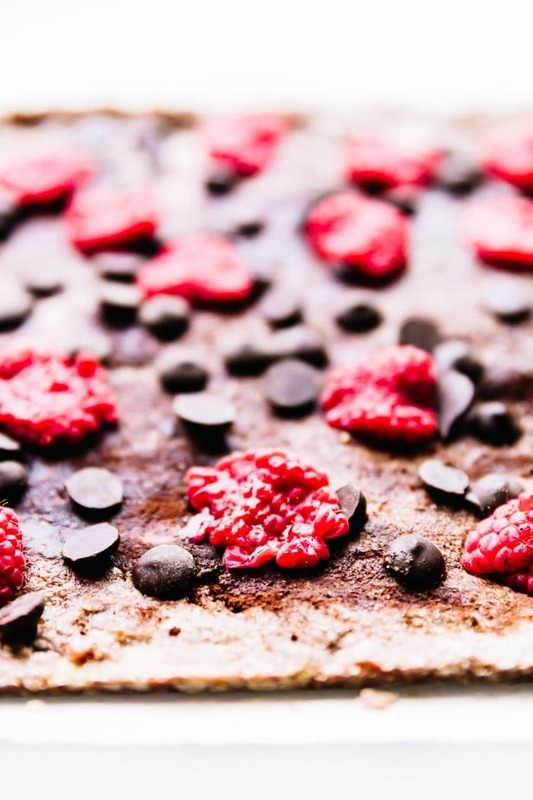 This edible cookie dough, packed with fresh raspberries and allergy-friendly, non-GMO dark chocolate chips, is the perfect healthy sweet treat for Valentine’s Day! This no-bake dessert recipe is gluten-free, vegan and paleo-friendly, and DELICIOUS. Just slice and eat! 12–15 raspberries (or other berry of choice) – sliced or small berries work best. Line a small baking sheet (7×11 or 8×11 works best) with parchment paper. Place nuts (a cup at a time) in food processor and pulse until nuts form fine crumbs. Repeat until you have a texture similar to an energy bite batter. 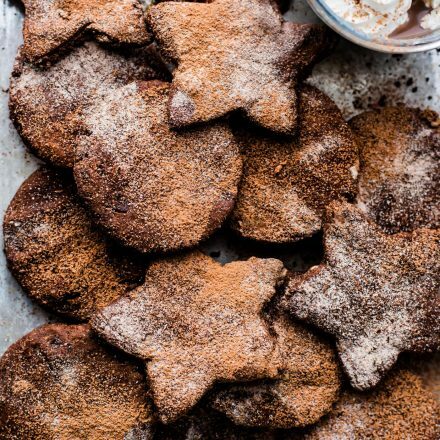 Add the vanilla, arrowroot starch (or other flour), and cocoa. Plus again until mixed. Next, add your maple syrup, coconut oil, and pinch of sea salt. Pulse until a soft texture forms; it will be quite sticky. Press dough into lined baking sheet, using a spoon dipped in a little cold water. Sprinkle dark chocolate chips over the batter and press into dough. Then gently press your fresh raspberries, making sure they do not extract too much juice. Place the dough sheet in the freezer for 10 minutes or refrigerate for 25 minutes (just until dough is firm). Remove from fridge and lift parchment paper and dough from tray. Using the paper as an aid, roll dough into a log shape, like a real cookie dough roll. Feel free to add more chocolate chips here on top if you’d like! Re-roll in parchment or wax paper and then in foil (if needed) Twist ends of cookie dough roll so it forms a tight log. Place in freezer for 10 to 15 minutes until firm. Cut into thick slices; serve. Alternatively, you can slice and roll into a cookie dough ball! Either works. Store cookie dough in fridge or freezer. If the batter is too moist to roll, add more flour or starch. If batter is too dry, blend in 1/2 to 1 tbsp more coconut oil. 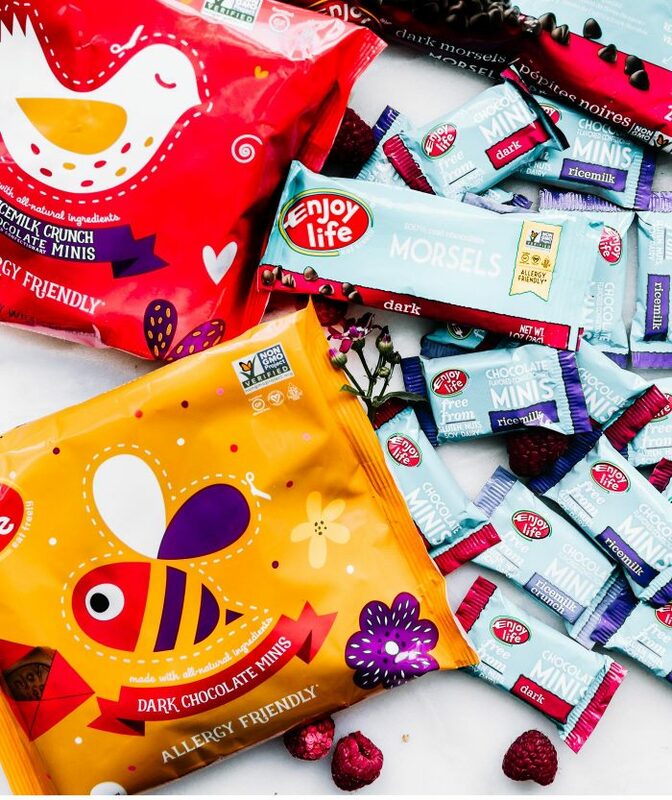 If you are looking for more grab and go Valentine’s Day treats (that are allergy friendly), then have no fear because Enjoy Life is here, again, with seasonal chocolate candies. LOOKY –> MINIS! Available in Dark Chocolate, Ricemilk Chocolate, Ricemilk Crunch, and a variety pack, they are the perfect solution for classroom valentine’s, special treats for your loved ones, and more. 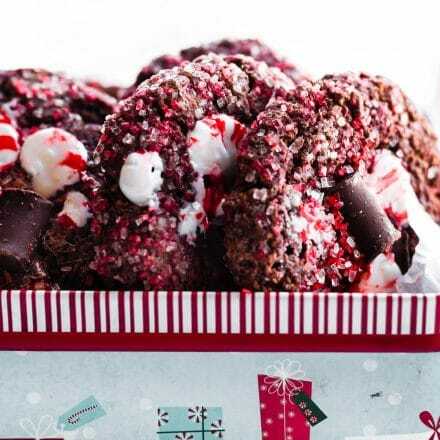 Want more no-bake chocolate recipes? I’ve got a few more for ya! Edible Cookie dough, check. Chocolate, check. Drooling, check! My job is done. We are thankful for the allergy friendly chocolate that Enjoy Life Foods provides. This would disappear in seconds here! Oh, my gosh, a guilt-free way to get my cookie dough! Thanks for the yummy recipe! How stunning and lovely is this dessert?!?!??!?! Oh my. I thought you’d love this one liz! This is absolutely brilliant and delicious!!! I love munching on cookie dough! Berries and chocolate chips are one of my favorite combos. This recipe looks amazing. I’m allergic to coconut oil. What can I use instead? What oils do you have? You could use melted butter, grapeseed oil, or some other neutral flavor oil. I definitely have butter. Do you think salted or unsalted? I could pick up grapeseed oil-I’ve never tried it. I wasn’t sure if another oil would work since coconut oil is solid at room temperature. Every time is see a no bake recipe with coconut oil I’m not sure the texture/firmness will turn out the same using something besides coconut oil because of that property. I want to try your protein ball recipes but I had the same coconut oil concern. They all look and sound scrumptious! Try unsalted. You just need that batter to be a little sticky first. And you can totally roll these into balls too if it doesn’t hold in the roll form. 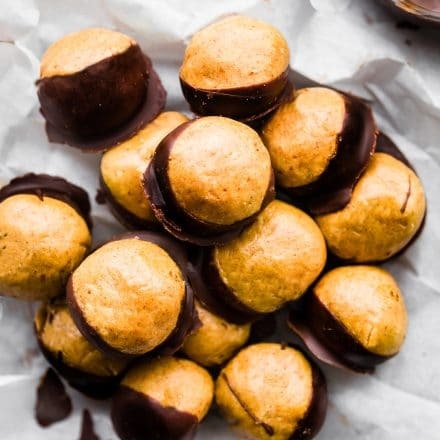 What other protein balls do you need substitutes for? Happy to help! Is this my recipe or someone else’s? I think if yo uuse no stir almond butter, creamy, you don’t need the coconut oil. Just adjust the nut butter/honey if it’s too dry. Hope that helps! 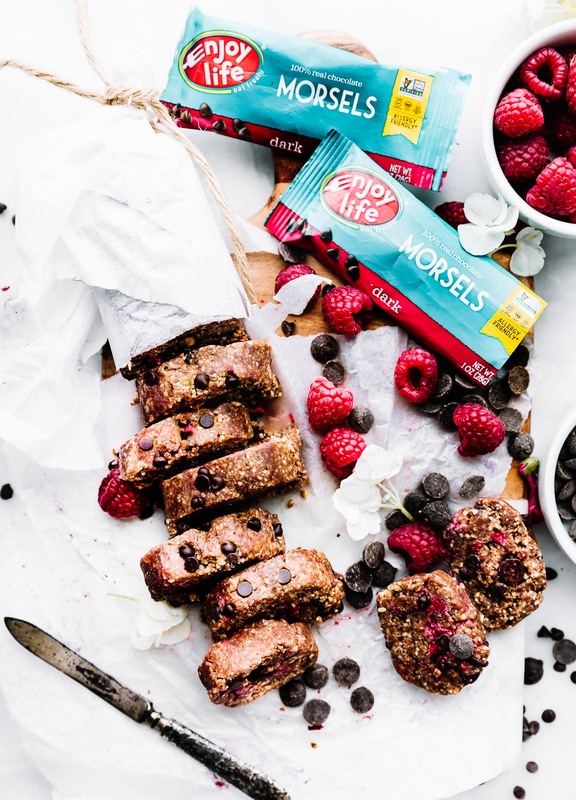 You had me at raspberries and then you threw in cookie dough. Forget about it. I’m yours. It doesn’t get much better than than edible cookie dough!!! Thanks for sharing this recipe. Very delicious cake. I will learn to make this cake.